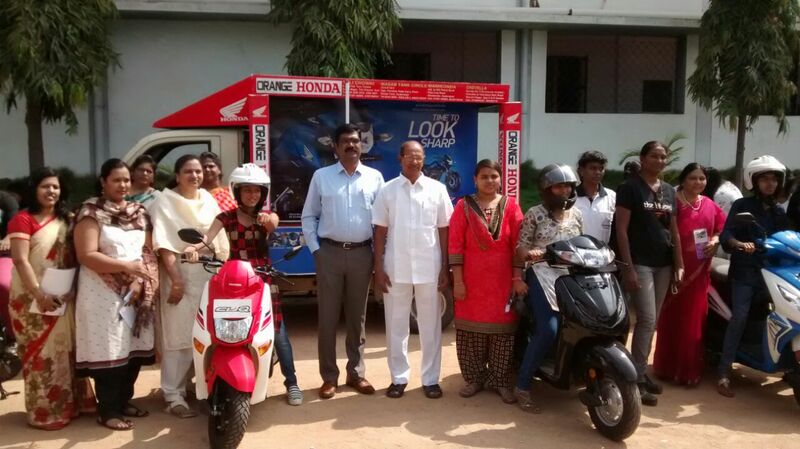 Tharuni and Bikernis of Hyderabadand Orange Honda have come together to launch two wheeler Training programme for Women , under 'Tharun Swecha'. Their aim is to empower the women with bike riding which makes life better with confidence and self reliance. The program was launched by the Joint Commissioner RTA, Sri Pandu Ranga Naik.at Wesley Degree College Campus on 03-10-2017. Orange Honda provided the vehicles along with Lady Trainers , and other safety equipment .Apollo Hospitals have come forward to provide safety manuals to give information on safety rules, self defense techniques and basic first aid kits. Traffic Police Officials addressed the gathering on road safety and traffic rules. The Transport Department has also assured to support the riders with required driving licenses.The Management of Wesley Degree college had given consent to hold the training sessions on every saturday from 7 A.M to 9 A. M.
Master Athelette of physical fitness Laxman Reddy, Srinivas from RTA Office, Rajitha , Lady trainer, Naresh Bahdur Veteran Rider,Shipa Bala Krishnan, Mumbai bikerni,Chauhan from Traffic Police spoke on the occasion. Dr. Mamatha Raghuveer, founder, Tharuni, and Jai Bharathi Bikerni of Hyderabad organised the launching program in a befitting manner.